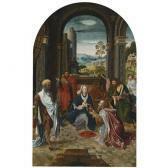 Find artworks, auction results, sale prices and pictures of Master Of The Von Groote Adoration at auctions worldwide. (Possibly) with Charles Mori, Paris, by 1926. Leonard Lewisohn (1847-1902), Hamburg-born American financier and philanthropist, 14 East 57th Street, New York, by whom acquired in the 1920s, and by descent to his daughter, Florine Lewisohn Henry (1878-1903), wife of Philip S. Henry (d. 1933), British coffee merchant, at Zealandia, Asheville, North Carolina, and by descent to their daughter, Violet Rosalie Henry Maconochie (d. 1976), wife of Brigadier Hartley Alfred Maconochie, CBE, DSO (1889-1974), at Zealandia, and subsequently at Bagatelle, Bermuda, and by descent. Anonymous sale; Christie's, London, 30 March 1979, lot 11, as 'J. de Beer' (withdrawn). Private collection. (Possibly) D. Ewing, The Paintings and Drawings of Jan de Beer, Ann Arbor, 1978, I, appendix A, p. 175, nos. 24-25. D. Ewing, Jan de Beer: Gothic Renewal in Renaissance Antwerp (forthcoming), chapter 5 and no. 10.1; (possibly) nos. 10.15-6. Along with a triptych in the Alte Pinakothek, Munich, which it closely resembles, this is the finest and most complete example of what has been described as "far and away the most popular composition" painted in Antwerp between circa 1518 and 1528. As such, it belongs to the moment of Antwerp's first ascendancy as the preeminent artistic and financial center in Nothern Europe, a position which it had acquired following the decline of Bruges, and which it would maintain for much of the following century. Professor Dan Ewing has identified the present painting as an exceptionally fine variant of a lost prototype by the Antwerp painter Jan de Beer (circa 1475-circa 1528). Ewing proposes that the prototype must have been one of Jan de Beer's masterpieces, the "first work to show the characteristics of his late style" (Ewing, op. cit., p. 118), but which is lost. Its success is demonstrated by the large number of copies -- Ewing lists as many as fifty completely or partially extant copies and variations of the triptych (forthcoming, op. cit., nos. 10-10.49) -- of which three are singled out for their superiority and ostensible proximity to the lost prototype: the triptych in Munich (Bayerische Staatsgemäldesammlungen, Alte Pinakothek, inv. 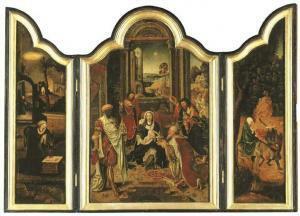 1431a-c; Ewing 10); a single panel of the central Adoration in the Hyde Collection, Glens Falls, New York (inv. no. 1971.2; Ewing 10.3); and the present work, which has long been attributed to the Master of the von Groote Adoration. Although Ewing places the Munich version first on his list, the high quality of the present work and its close proximity to the Munich version suggests that further technical analysis is needed to establish primacy between them. What is clear is that both the present triptych and that in Munich are precious records of what must have been one of the great achievements of Antwerp Mannerist painting. Since the notion of an Antwerp Mannerist style was first formulated by Friedländer in 1915 (in the seminal article "Die Antwerpener Manieristen von 1520", Jahrbuch der Königlich Preussischen Kunstsammlungen, pp. 65-91), Jan de Beer has been regarded as one of its central figures. First mentioned as a member of the Antwerp Guild of Saint Luke in 1490, he became a master in 1504 and subsequently served as alderman and dean. Initially classified by Friedländer as the Master of the Milan Adoration, his identity was established on the basis of an exquisite signed drawing, Nine Male Heads, in the British Museum (Department of Prints and Drawings, inv. no. 1892.8.4.15). Ewing dates the lost prototype of the present triptych to circa 1518-1519 (op. cit., chapter 5), based on similarities to Jan de Beer's triptych in Milan (Milan, Pinacoteca di Brera, inv. no. 620), for which the terminus post quem is believed to be 1518, and on the date '1519' which appears twice in the central panel of a version in Karlsruhe (Kunsthalle, inv. no. 145; Ewing 10.19). Both the present triptych and that in Munich were probably painted around this same time. 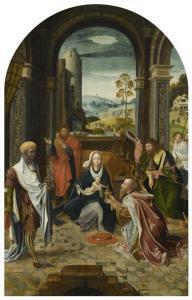 Friedländer's attribution of the composition to The Master of the von Groote Adoration, one of the key figures of the Antwerp Mannerist school as he defined it, is not irrelevant; the von Groote master may have been a close collaborator of de Beer's (perhaps even an unidentified pupil); Ewing himself pointed out that Friedländer's attribution only lends support to his subsequent relocation of the type into the de Beer corpus (1978, op. cit., p. 120). For Ewing, the terms 'Munich Adoration' and 'Munich design' are shorthand for what is known of the lost de Beer original, exemplified not only by the triptych in Munich, but also by the present work. "Aside from being the single most-copied painted design in Antwerp art during the teens and 1520s, the Munich Adoration composition is equally remarkable as the most scrupulously planned and aligned of all the artist's extant figural arrangements" (Ewing, forthcoming, op. cit., under no. 10). Professor Ewing's assessment of the 'Munich design' applies fully to the present triptych, which he holds to be an "especially faithful" performance of the winning composition. The provenance of the present triptych can be traced back by family repute to the 1920s, when it belonged to Leonard Lewisohn, one of three brothers from a prominent Hamburg merchant family who traveled to the United States, founding the firm Lewisohn Brothers in 1866. The firm would soon come to specialize in the metal trade, dealing in lead and copper. The triptych passed by inheritance to one of Leonard Lewisohn's daughters, Florine, whose husband Philip S. Henry was himself an avid collector. For many years the triptych hung in the neo-Tudor mansion built by Henry on his estate of Zealandia, near Asheville, North Carolina, named to the U.S. National Register of Historic Places in 1977. We are grateful to Professor Dan Ewing (Barry University, Florida) for his assistance in cataloguing this previously unpublished work. With Gebr. Douwes, Amsterdam, by 1964, from whom acquired by theuncle of the present owner. Delft, Prinsenhof, XVIe oude kunst- en antiekbeurs der Verenigingvan Handelaren in Oude Kunst in Nederland, 4 - 24 June 1964 (withGebr. Douwes). This composition, often employed as the central panel of atriptych, is known in several variants by the Master of the VonGroote Adoration and his workshop. It is particularly close to thatin the Bayerische Staatsgemäldesammlungen, Alte Pinakothek, Munich(inv. no. 1413a, b, c), where it forms part of a triptych, a factwhich led to the confusion of the provenance of both pictures atthe time of the 1942 and 1950 sales (see Provenance). , the present whereabouts ofwhich are now unknown. Other examples from this groupare in the John G. Johnson Collection, Philadelphia (inv. no. 383)and the Staatliche Kunsthalle, Kahrlsruhe (inv. no.145). 1. See A. Janssens deBisthoven a.o. (ed. ), Anonieme Vlaamse Primitieven, Bruges 1969(exhibition catalogue), p. 161. 2. See M.J. Friedländer, Early Netherlandish Painting, vol. XI,Leiden/Brussels 1974, p. 70, cat. no. 29a, b, c, plate 39. The composition was one of the most popular of the Antwerp Mannerists, regarded by Dan Ewing as being based on a lost prototype by de Beer (see D. Ewing, The Paintings and Drawings of Jan de Beer, diss., Ann Arbor, 1978, I, pp. 172-7). Friedländer regarded the present type as being by the hand of the Master of the von Groote Adoration, an anonymous artist whom he named for an altarpiece formerly in the von Groote collection, Kitzburg (see M.J. Friedländer, Early Netherlandish Painting, XI, Leiden, 1974, p. 70, no. 27, pls. 36-7), although subsequent scholars have questioned whether they all derive from the same workshop. Certainly, however, the present work seems particularly close to the triptych in the Philadelphia Museum of Art (John G. Johnson Collection), given by Friedländer to the von Groote Master, and catalogued by Ewing within his Group II: the Munich type, after the triptych in the Alte Pinakothek. We are very grateful to Dr. Peter van den Brink of the Bonnefanten Museum, Maastricht, for his assistance in cataloguing this lot. 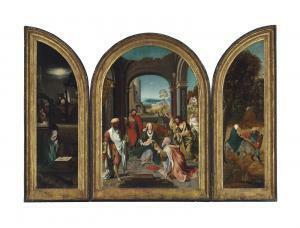 Workshop of the Master of the Von Groote Adoration Active in Antwerp, first quarter of the 16th Century altarpiece inner and outer wings, framed together: recto: the adoration of the magi and the nativity; verso: the annunciation oil on panel overall: 108 by 76.7 cm. ; 42 1/2 by 30 1/4 in. painted surface (of each panel): 97.5 by 30 cm. ; 38 1/2 by 11 3/4 in. These panels have borne several attributions, including, most implausibly, the Master of Delft, and the Master of the Abbay of Dillighem, now generally identified as Jan van Dornicke. The composition of the left hand wing however, derives from that of the central panel of the eponymous altarpiece by The Master of the Von Groote Adoration, in the von Groote collection at Kitzburg. 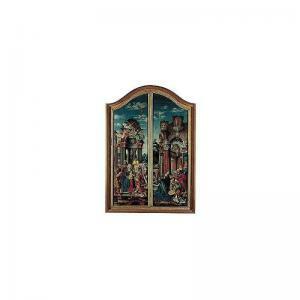 The panels are also very similar in style to the work of this Master, who favoured extravageant architectural settings. Provenance: Probably bought for the present collection in Paris in or shortly after 1958.